One of my favorite times of the year is coming up! Halloween time! I am so excited for Fall to be right around the corner and Halloween to be here. 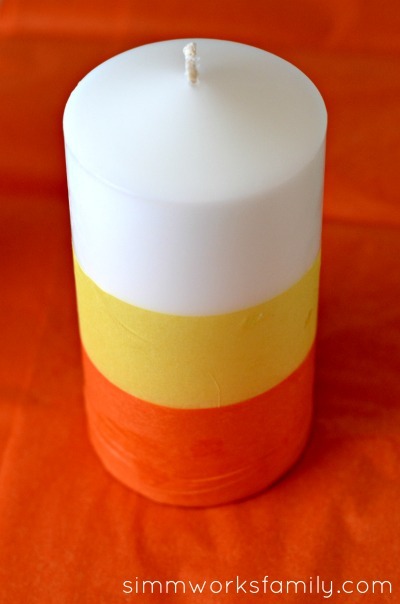 So much so that I busted out my craft supplies and made these awesome DIY Candy Corn Candles in anticipation of my fall tablescape. 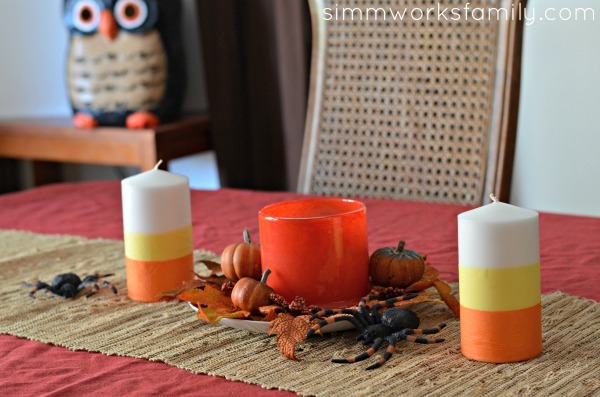 Since these candles are oh-so-simple to make and pair perfectly with this cute orange candle holder I just scored at Target for $4 I figured why not get this up and posted now in case anyone else is as crazy as me about Halloween and Fall decor. And how great do these look with my Halloween centerpiece? 1. Measure out the width of yellow tissue paper by placing the candle on its side and making a mark where you want the tissue paper to go up to. 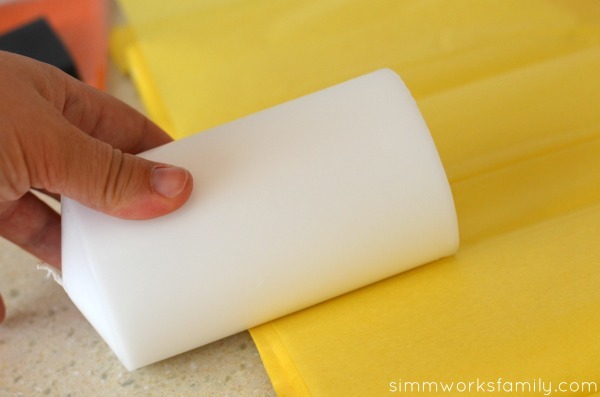 Then cut off a strip of tissue paper in your desired width. 2. 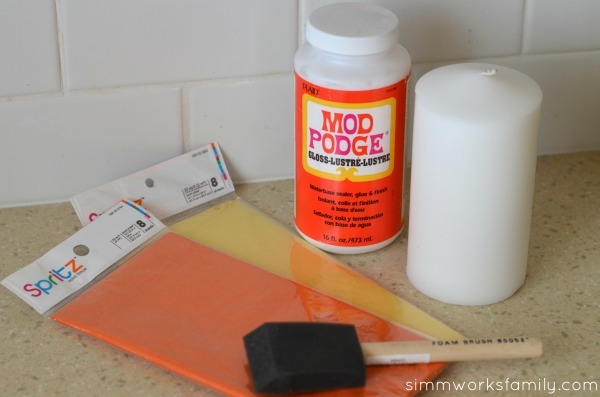 Apply a thin layer of mod podge to the base of the candle and attach tissue paper to the mod podge. Gently smooth out any wrinkles as you apply the paper (easier said than done!). 3. 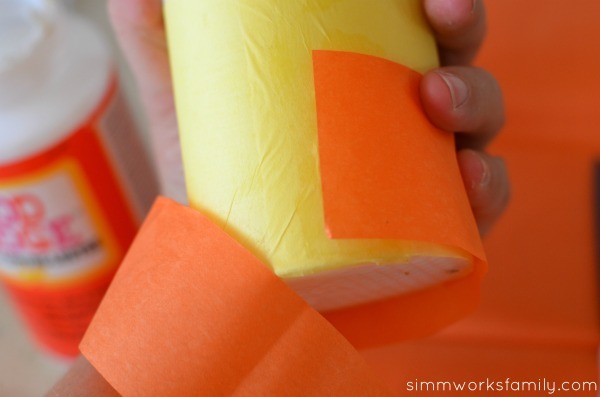 Measure out an orange piece of tissue paper smaller than the yellow (about 1/2 the size) and repeat step 2. 4. Repeat with a second candle to make a pair and let your candle(s) dry completely before setting out on display. 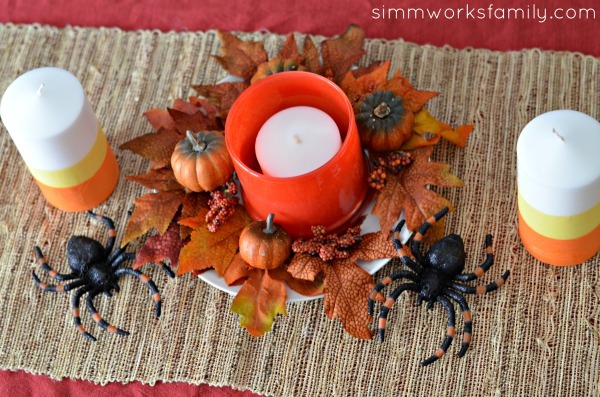 To complete this centerpiece look simply add a cute glass votive, some fake autumn leaves and pumpkins (found at your local craft store or if you’re like me, in the garage), and a nice burlap table runner to go on top of a fall colored tablecloth. 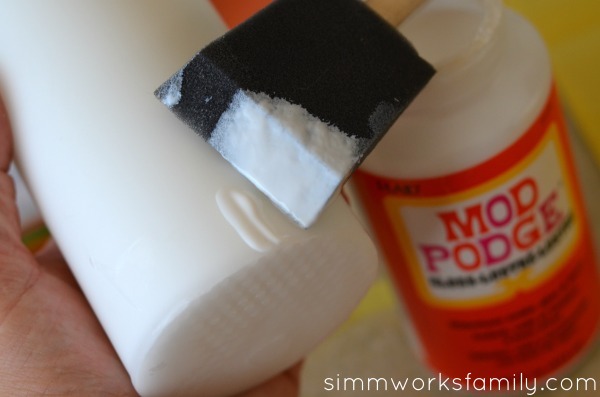 To make it even more perfect for Halloween add some spiders to the mix! Please note, however, that these are decorative only. Wouldn’t want to start any fires! What’s your favorite part about Halloweentime? Can you burn those w/o starting a fire? LOL Super cute idea!! I bet even I could do it! Totally trying that! Ronni – it totally thought that at first too, but then I thought of all the DECORATIVE candles I have, besides, Danielle points that out too! Super cute! I love decorating around my fireplace for fall, and these are perfect! Those are the cutest candles EVER! Will definitely have to make them! 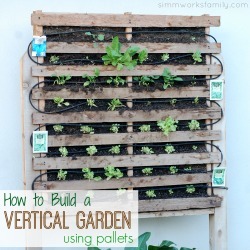 So adorable and easy! Love it! These are so creative! I love that you used tissue paper, genius!! 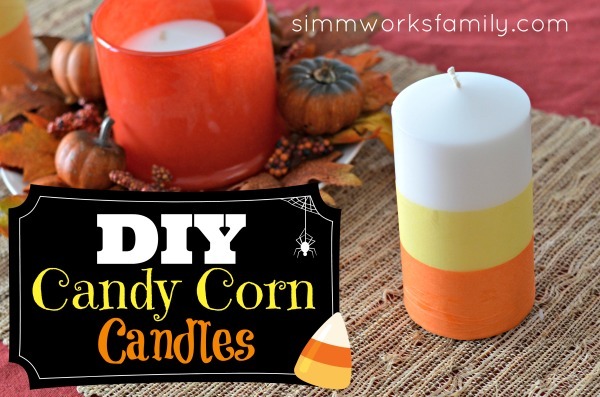 Those candles look really cute, I love the Candy Corn theme! This candles are so adorable! I can’t believe you just used tissue paper to do them! These are so cute and you could truly customize them with any color! 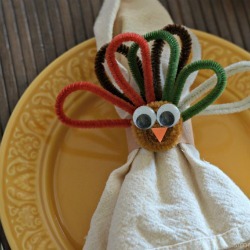 Super cute and easy! 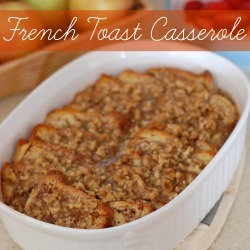 I think this is going on my list…. Just made these with my girls. Ours aren’t quite as pretty, but we love them. Thank you for a great craft. 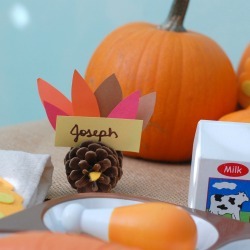 I can see having fun with making these for other holidays with different colors of paper too. 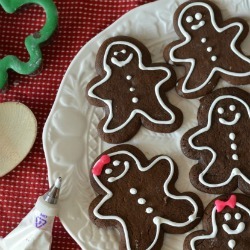 I’m glad you were able to make them with the kids! The next batch we made I cut small squares out of the tissue paper and let the kids glue them on in whatever pattern they wanted. They loved it.